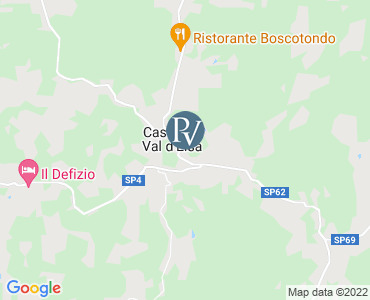 Elm apartment is on an ancient property whose origins date back to 970 and where in 1308, in the presence of officials from Florence, Pisa and Volterra, the official borders of Volterra and San Gimignano were defined. For centuries the estate was subject to ransacking and reconstruction of parts of it under different owners until it was acquired by Marquis Capponi. The Grand Duke of Tuscany has often stayed here during his travels in Tuscany. The property is situated on a hilltop and dominates all the nearby valleys with views that extend as far as the eye can see for tens of kilometres. The surrounding countryside has several acres of forest with oak-trees and cypresses interrupted by wheat fields, vineyards and olive groves. The property has been completely renovated and is composed of the Mansion house and 14 independent apartments with their own private space to eat outside. Guests have a beautiful swimming pool (20x10 metres) at their disposal, situated in a sunny and panoramic position. At only 200 metres from the property you will find a typical Tuscan Trattoria where you can snack and buy local products. Take away service by the restaurant. LOCAL TAX - all tourists are required to pay €1 per person per night (except children under 14), for the first 6 days. The payment is compulsory and must be in cash directly to the owner on arrival.